Melville gives William Barber here in 1856, but Craven gives William Hall in that year. The 1858 Post office Directory has separate entries for William Barber and William Hall, both at this house. House dates from the 16thC. 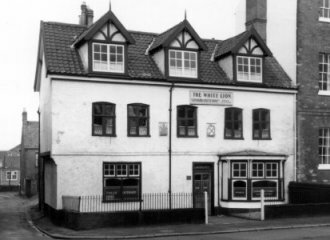 24th September 1784 - William Marley of the BLACK PRINCE informed his Friends and the Public that he had taken the White Lion, St. Martin's Plain. Offered to let from Christmas 1788 - Enquire of Mrs. Dye in the same Parish. One of 36 Norwich houses opened for the reception of Voters in the interest of Mr. Windham and Mr. Coke on election day Thursday 13th November 1806. The name of the Hundred for which the house was appropriated was to be displayed at each house. On Tuesday 7th May 1833, Mrs. Elizabeth Peters died suddenly, aged 50. On the following Saturday, 11th May, the only child of Mr. and Mrs. Peters, Harriet, died aged 19. On Tuesday 19th June 1855, Mr. William Barber held a sale of part of the Useful Household Furniture, two capital, strong Cob Ponies, (13 and 14 hands high, warranted sound), three neat Pony Gigs, excellent Phaeton, two strong Luggage Carts, three sets of good Pony Harness, young Grey Parrot and Brass Cage, and other miscellaneous effects. Renamed the WIG & PEN 1985. Dormer windows and ground floor bay are probably Victorian additions. c20th C wooden settles in lounge bar. Several Coats of Arms on exterior above ground floor, probably mediaeval. Larger, more spartan public bar undergoing re-decoration at time of survey. Reputedly the site of the oldest Ale-house in Norwich.